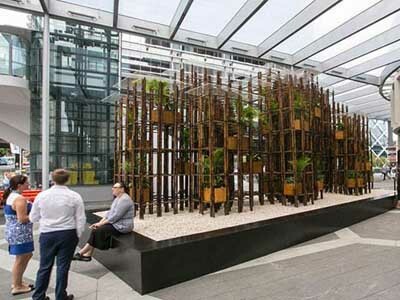 Allplastics Engineering supplied clear acrylic panels for a new public art installation in Barangaroo, Sydney. The Barangaroo precinct in the newly developed north-western edge of the CBD will be a showcase of art and culture for public enjoyment. The Green Ladder display is a contemporary art installation created through a collaboration between Barangaroo’s Delivery Authority and the Sherman Centre for Culture and Ideas. Originally commissioned by the Sherman Contemporary Art Foundation in 2016 for the Architectural Pavilion series ‘Fugitive Structures’, the Green Ladder by Vo Trong Nghia uses bamboo to represent sustainable and green architectural practice. Having experimented with building using bamboo, Vo Trong Nghia’s architects are incorporating other facets of nature into their practice including concepts such as natural ventilation in residential commissions as well as urban or vertical farming through educational projects. Allplastics Engineering provided custom cut 12mm thick clear, understated acrylic panels for the art display.